It’s been over a year since I started at Soapbox Films and I just wanted to pause and celebrate the fact that I have been making a living off my art for over 12 months! That’s…a pretty big deal for me. I never went to art school and I’ve long ago thought I’ve missed all the opportunities to pursue art careers. One year ago, I moved back to Los Angeles anxious and uncertain about my future; I’ve decided I was going to take a chance and give storyboarding as a career option. I guarantee you in my wildest dreams I had no idea I was going to end up drawing animated characters from Disney, Dreamworks, 20th Century Fox and that I was going to be part of the industry I’ve always had a deep and lasting passion for. Moana is special to me because she’s the first Disney “princess” I’ve had to draw in my first week at SBF. She’s brown-skinned, beautiful and easily reminds me of women from my own culture. I was fighting back tears driving home my first few days thinking how lucky I was to be in this position. I remember how special it was to watch Mulan onscreen so many years ago and feel that connection with her. (I’m Filipino-Chinese, by the way so I get to identify with these two characters!) 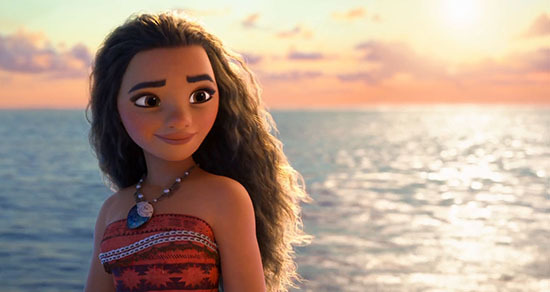 I know Moana is going to be just as special to so many little (and not so little) girls. I am fiercely proud to be even just a tiny part of that. I want people to fall in love with her, too. I’m so grateful for the people who have made it possible for me to get here and I want to keep learning and growing from this point on. The second volume of Polterguys is still chugging along! If I get enough pages done, maybe it’ll mean I can release a printed book next year. I’m still working on a storyboard portfolio too, saving up for more classes and taking in as much as I can to understand film and storytelling better.